This handsome and patriotic decoration will be highly appreciated by members of the USN on your gift list. The navy military hero personalized Christmas ornament features classic military styling, patriotic colors and the USN crest with excellent detail. Each of these military ornaments arrives with a holiday display cord, our classic velvet gift bag and the custom information you provide hand lettered onto the front. 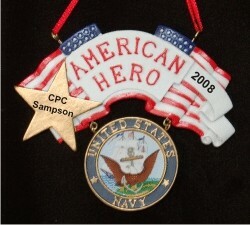 Honor your naval hero anytime with the navy military hero Christmas ornament personalized to make it a memorable keepsake.